I had entries in the Viewer sorted by Connection name in ascending (alphabetical) order prior to upgrading to version 6.7.0.2. Now when opening the Viewer, all Online connections under the General address book are in some random order. Offline/Unknown connections are still in alphabetical order by Connection name. If I click on a Folder and back to the General address book, they return to alphabetical order. Now the additional problem. If I connect to a system that is Online, it moves to Logged on group. When I log off, it goes to the end of the list of Online connections. It no longer goes back to it's place in alphabetic order. Connect and Logoff, it's at the end of the list. Do you have Use group view enabled on the View tab in Options? That helps you first group (online, offline etc.) and then sort within groups. That's for pointing at this issue. We'll see if we can fix it. Yes, I have Use group view checked. And the Connections are grouped correctly, they are just not sorted correctly in the Online group. Note, it is just the Online group that is not sorted correctly. The Offline group is sorted correctly. While on the subject, another annoying issue (not necessarily a bug) is that in the Group view groups do not stay collapsed with each launch of the viewer. I have quite a few Folders, so I collapse the Folders group in the right pane with the Connections. I have to do this each time I launch the Viewer. It does not remember that I have the group collapsed. 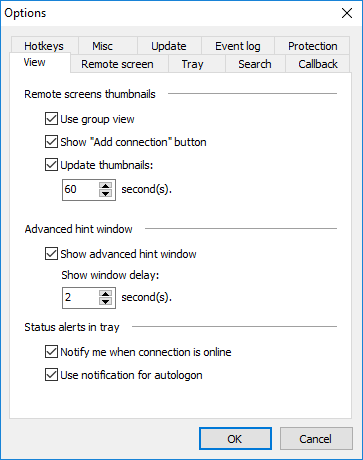 Saving this setting on close of the Viewer would be a great addition. Our developers informed me that the online connections sorting issue is a bug. They said it would be fixed in the very next update. We'll definitely see if we can fix that also. Thanks!